Hosting a conference in Colorado can be fun and exciting. From ski resorts to vibrant nightlife, Colorado offers something for every conference type and every conference attendee. 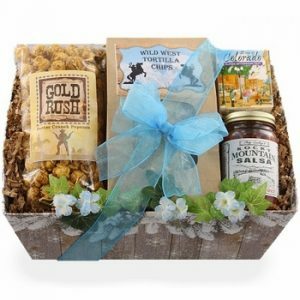 But if you are planning a conference in Colorado and need a special way to welcome speakers, sponsors, or VIPs, consider using a Colorado gift basket to make them feel welcome. Welcome sponsors setting up their trade show demonstrations by placing Colorado gift baskets at their respective booth spots. Or, you can say “Thank you!” after the event by sending a basket to their home offices. Greet VIP guests by asking your hotel to place Colorado gift baskets in each of their rooms upon arrival. There’s no better Rocky Mountain greeting (except for the views!). Furnish your conference speaker green room or holding area with one or more Colorado gift baskets that can be enjoyed between or before speaking engagements. Speakers will always appreciate a little something to nosh on! And these are just a few ways you can enjoy Colorado-themed gift baskets as part of your conference. Hosting an event in Colorado? Contact us to learn more about our gifts to help you welcome sponsors, speakers, or other VIPs!